This end times deception study will teach you about the fulfillment of the prophecy of the Two Witnesses of Revelation 11. Most Pastors teach that the Revelation timeline of the two witnesses is during 3.5 years of Great Tribulation, the latter half of a 7-year tribulation, where two Old Testament characters, such as Moses and Elijah, return to Earth to prophesy, be killed by the Antichrist, and then come back to life. That’s the literal interpretation, but throughout Jesus’ Revelation He relates prophecy symbolically. Most of the symbols are from the Old Testament, so if you don’t know the Word of God, you can’t understand the symbolism and the meaning of the book of Revelation, and you’re left to take it literally. The Revelation of Jesus Christ in Chapter 11 continues the story of how God used the Bible, which is called the Little Book of Revelation 10, to have His witnesses delineate who was the true church of Christ, and who was the false church of the Antichrist. What is the context of the Two Witnesses of Jesus Revelation? Satan learned that when he had the Romans persecute the Christians, the church only grew faster, so he created a new strategy. He created a false Christian Church to seek to destroy Christianity from the inside. He created the Roman Catholic Church, which pretends to be Christian, but is really the old religion of Babylon, of Sun worship and Satan worship. The word ‘catholic‘ means ‘universal‘, which is appropriate as they claim to be the Universal Church that leads to God. The Satan-empowered Catholic Church reigned for 1,260 years, from 538-1798 A.D., which matches the time that the Two Witnesses prophesied. It is not 3 1/2 years during the end times, like many Pastors teach. And it obviously is not two people who prophesied for 1,260 years. 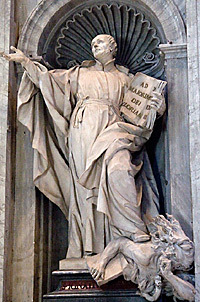 In this image is Ignatius Loyola, the founder of the Jesuits of Rome, who were empowered by the Roman Catholic Church in the 16th century, to counter the Reformation, when millions of people were coming out of the Catholic Church. He is stepping on a Protestant, who is holding a Bible. This tells you who are the Two Witnesses of Revelation 11, who witnessed against the Roman Catholic Church during their 1,260 reign, from 538-1798 A.D. They are the Word of God and the Church of Christ, both which testified about the pure Gospel of salvation through Jesus’ atoning blood, not by works through the Catholic Church; and they testified that the Papal Church was a false church, the Harlot of Revelation 17. They preached a message of salvation and of judgment, just like John the Baptist and God’s other prophets. Jesus’ Church testified during two church eras that existed during the 1,260 years of Catholic Church reign. During this time period called the Dark Ages, the Catholic Church systematically destroyed most copies of God’s Word, and killed millions of Christians who possessed them. Jesus Church was trampled on by the Papal Church so much, that their ability to read the Word of God was eliminated, therefore they didn’t understand the pure Gospel of Christ, only what the Catholic Church taught. And they didn’t understand that the Catholic Church was the Antichrist Beast. They had become spiritually dead. From 1514-1798 A.D, the Sardis Church era was the time that the Protestant Reformation was birthed, where millions of people came out of the Catholic Church and formed the Protestant Churches. It led to the Great Awakening where worldwide missions when millions of people being saved. The Little Book of Revelation 10 study revealed that the Little Book is the printed Bible, which combined with the advent of the printing press, became available to millions of people, much to the dismay of the Catholic Church. So the context of the Two Witnesses is at the end of the Church era of Thyatira and the beginning of the Church era of Sardis. The rod of iron is the Word of God, which the Church was just given, so let’s see how the Church uses it to break the power of the Antichrist Catholic Church. NOTE: Even though the Two Witnesses of Revelation has a specific context in time, it applies to every Church era, especially our Laodecian Church era, where we have been greatly deceived by the Catholic Church. Our mandate is to preach the pure Gospel of Jesus, and to identify the false Catholic Church as Antichrist. The first part of Revelation 11 defines the assignment of the Two Witnesses. When Martin Luther and others measured the teachings of the Catholic Church against the Word of God, they were able to see that it is the false church. They found no justification for a Pope or hierarchy of Archbishops and Bishops, just the five-fold ministry of the early church. They found no place of purgatory, where people could be refined, so that they could go to heaven. They learned that good works don’t earn salvation, they only testify to one’s faith in the Lord. That they did not have to go to a confession box with a priest, but had direct access to Jesus the High Priest. That they didn’t have to count rosary beads, or pray to anyone like Mary, but only to the Father in Jesus name. They found the simplicity of the Holy Communion, but no mass ceremony, and no wafer that supposedly becomes the body of Christ. They discovered salvation by faith in Jesus sacrificial death and resurrection, not in works, and not through the Catholic Church. They found that all of these things were strange and alien to the Word of God, and they testified that the Catholic Church was not Christ’ true church. But the court which is without the temple leave out, and measure it not. for it is given unto the Gentiles. That includes the Catholic Church, who teaches salvation by works through the Catholic Church, and all the Catholics who follow their teachings instead of Christ’s. This also includes Protestant Churches, who are merging with the Catholic Church, who teach a different Gospel, who are trusting their works, not the work of Jesus. The Holy City is not Jerusalem and it is not Rome. Remember, Jesus is speaking symbolically. The Holy City is the bride of Christ. Jesus bride is the called the Holy temple, the Holy City, the New Jerusalem. The Roman Catholic Church tread underfoot the Church of Christ, for 1,260 years (42 prophetic months), from 538-1798 A.D. In Jesus words to the Sardis Church era, which began in 1514 A.D, He declared that they were dead, but then commanded them to take action. So being called dead was referring to the spiritual state. Messiah has been crucified in Babylon itself in his members, who have suffered persecution and death. He clearly was saying that persecuting the saints was the same as persecuting Him. The treatment of his friends–his church–was such that it might be said that he was ‘crucified afresh’ there; for what is done to his church may be said to be done to him. In Luther and the Reformers, the slaughtered witnesses to the truth of the gospel, risen from the dead, stood once more upon their feed before Rome and the world. This was what the martyr Huss, a hundred years before had foretold. Now we are in the era of the Church of Laodecia, when Jesus called us wretched, miserable, blind, poor and naked, and we don’t understand the deceptions of the Jesuits of the Roman Catholic Church. We should be preaching the Gospel to the world and identifying the false Church, but instead we’re playing Church. The previous church eras prophesied against the Catholic Church. The pure Gospel of salvation by faith in Christ Jesus atoning sacrifice; exposing the false doctrine of salvation through the Roman Catholic Church by works. 1.2 Billion Catholics worldwide are believing in salvation by works, through the Catholic Church. And Christ’s Church dismisses the need to call them out into the pure salvation through Jesus alone. The previous church eras testified that the prophecies in Daniel and Revelation clearly point to the Roman Catholic Church as the Satan-empowered ‘Beast‘ of Revelation, the ‘Little Horn of Daniel‘, the ‘Great Whore‘, ‘Mystery Babylon‘ and the Pope as the ‘Son of Perdition‘. The majority of today’s Christians don’t understand the fulfillment of these clear prophecies, so they speculate about an end-times Antichrist. In fact they aren’t concerned about these things, because they (mistakenly) believe that they will be raptured out before the supposed 7 year tribulation period. The Lord is raising up a remnant to preach the pure Gospel of Jesus, and to testify against the Antichrist Roman Catholic Church. Do you want to be a part of God’s remnant that helps redeem the captives from the Papal Church? If you answered yes, then you need to read all of the studies on this website, to know the truth, because the enemy has greatly deceived the Church. Just know that when God’s saints testify the truth and oppose the enemy, there will tribulation, there will be persecution, you will be rejected by Christians who think they know the truth. When Pastors teach that the Two Witnesses of Revelation 11 is an end-times prophecy, they are removing blame from the Roman Catholic Church. They are False Prophets who have misled their flock, and they will be held accountable before the Lord. If your Pastor is teachable, share this study with them, so that they and their flock can know the truth, so that we can overcome the Harlot of Babylon, the Antichrist Universal Christ. Well absolutely blown away, I have been viewing and reading about the “end times” for a while. This is a completely different prospective, and it fits. I am going to read in detail and check it out. Fantastic work. Thank you for your comment Alan! The Historicist view of prophecy fulfillment was taught by the great theologians of the 16th-20th centuries, but the enemy has pushed their witness aside; and has filled seminaries and Bible colleges with the false, futuristic explanations; and that most Pastors and Christians are deceived.